On the heels of my last posting to the Cultural Worker, as news of the passing of Will Connell becomes more widespread, I am happy to report that Will's week at the Stone shall stand. Even through the blue reality, there is cause to celebrate. His residency at this, one of the few Downtown spaces left downtown, set for December 23, 26, 27 and 28, was all Will spoke about for months. His daughter Safiya Martinez recently told me that the week of concerts at this space, "was simply his dream". He had planned on the concept for years and was working tirelessly to get all of the music together, arranged, copied out. It would not be hyperbole to say that Will was living for this event. This makes the strange and sudden loss that much more of an injustice. But, in classic Will style, the musicians already dedicated to this residency are making no fuss, no moan, and carrying on. In tribute. It was nearly noon and so I hurriedly moved east on 8th Street, into St Mark's Place after my ascent from the subway station on lower Broadway. It was a long walk but one I have always enjoyed: even with the gentrification, with NYU taking over the landscape, even with the well-heeled corporate-types pretending to slum it and the wannebe hipsters carrying plastic arts dogma close at hand, that part of Broadway melds wonderfully into the East Village. They cannot squeeze the bohemian spirit out, even when the bohemian is priced out. That's both the lure of New York and its shame. Once inside Tompkins Square Park you can almost forget the gleaming glass towers within range---and that so many powerful musicians, writers, painters, actors and dancers have lived and worked here. Rarely thriving, almost certainly struggling, but ensuring that this downtown area would remain hallowed ground. Will was among them, maintaining the rigors of a day job just to pay the rent while living out his calling. And like most, he suffered the devious developers, vampire landlord archetypes, breathing down his throat. The artists that pave the road in the poorest 'hoods are eventually driven out, one way or another. Yeah, its New York's shame. Emerging onto Charlie Parker Way I moved quickly over to 9th and found my way to Will's place. Safiya greeted me with a warm hello. Ras was there already. She asked that we three stand over Will's piano where she'd set a candle and some small remembrances of her father in modest reverie. She spoke across the spectrum to Will and asked him to help in our search for the charts we needed to carry out his vision. After a moment, we were into our task, soon joined in by her mother/Will's ex-wife Thea Martinez, Rocco and then Jason--who'd worked with Will for so many years and was invaluable in assessing the music we went through. . I looked around the neat studio apartment with its white walls and basic furniture, and marveling over the books: on shelves, in stacks and sitting in most of the otherwise empty spots. The guy was a real intellectual and his choice in books, on Black Liberation, yoga, the horoscope, world history, art, literature and philosophy, and in no particular order, spoke volumes. Where would this man have stored the manuscript we so desperately needed? Carefully rummaging the boxes, the stories of Will began and there was laughter. Gentle remembrances and bits of imitations of some of his catch-phrases--his raised eyebrow smirk, his tendency to lean in close when trying to get your attention. We saw scores for works dating back 40 years amidst clippings he'd saved, handwritten notes and a few photos. In no particular order. Folders filled with standards could include a flugelhorn part from "Intaka"; stacks of his copying work for David Murray might contain lists of his ideas; the backs of envelopes were as valuable as onion skin manuscript paper in this search. Realizing that parts of "World Peace" included Will's compositions performed in more recent times, we separated the pieces and made sure to compile the part we'd probably need. After we found some important components, the group, now joined by yet another musician friend, came to the sad conclusion that perhaps we simply weren't going to find the Tapscott-era material--the main part of the first set slated for December 23. Or its important poetry, that which told the tale of "World Peace". This was troubling, to say the least. Where could this material be?? But something had me take a look in a box someone else had already gone through. "No, no, its not in there", I was told, "I already examined everything". But something had me continue on. I lifted up a pile of charts from the large box and looking downward could see, clipped together, a small stack of photocopied sheets. It stood out so I pulled it up and out. Here were the Tapscott-era charts! We scrambled back into the box and found another similarly clipped stack; yes, it was indeed the poetry! Will came through after all. As winter descends over Alphabet City, the homeland of radical arts mourns the loss of one of its own. Saxophonist/bass clarinetist/composer Will Connell Jr died on November 19; his music and life are to be celebrated in a Christmas-week event at the Stone. 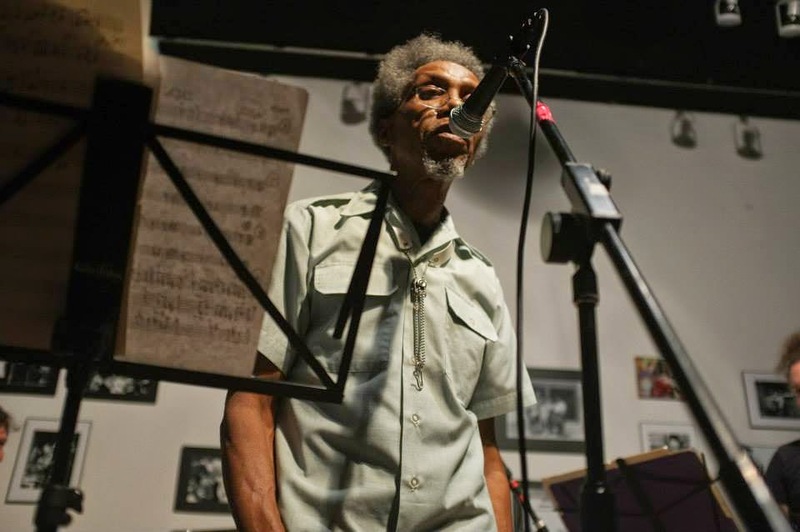 He came of age in the 1960s as an invaluable part of Horace Tapscott’s organization and the LA Black Arts Movement, and stood as an underground giant of NY’s Free Jazz and New Music circle since 1975. His sudden passing occurred just weeks before his planned residency at the Stone (Dec 23-28) and days shy of his 76th birthday. The musicians who were to be a part of Connell’s residency have vowed to keep his vision alive in this series of concerts which now stand in his honor and memory; all of the proceeds will serve as a fundraiser for Will’s family. The music performed will be an amalgam of Connell’s more than half-century as a performing artist: compositions ranging from those associated with Tapscott to his latest works as well as the free improvisation he was so fond of. The variety of sounds embody Connell’s stage and studio life; his resume sported gigs with Cecil Taylor, Sam Rivers, David Murray, William Parker, Charles Gayle, Chico Hamilton, and Anthony Braxton. A core downtown figure, Connell also engaged James Chance, Minor Threat, Black Flag and Ryan Adams in creative endeavors—a performance pedigree ranging from hip Jazz to New Thing to No Wave. From basement clubs to the Newport and Moers festivals to nation-wide TV broadcasts. The musical fabric Connell brings to the Stone also includes his work as a music copyist, laying down the score for Ornette Coleman’s “Skies of America”, the World Saxophone Quartet and many of Motown LA’s best. Known as an understated, quiet giant of the music, Will Connell’s voice is best heard through his alto saxophone, bass clarinet and flute, drenched in the rich tapestry. The program at the Stone will open on December 23 with words by Will’s daughter, poet and actress Safiya Martinez, and then move into two powerful sets by Will’s 13-piece band, the Dark Tree Ensemble. This collection of works, “World Peace, With or Without People: Music from the Legacy of Horace Tapscott”, is split between LA compositions and those from Will’s nearly 40 years in NYC. This world premiere, featuring Tapscott’s brilliant music in perspective and also as a reference for Connell’s own compositions, promises to be historic and serves as a statement for these years of ongoing global conflict. Christmas Eve and Christmas Day the club is dark, but the residency continues from the 26th through the 28th. The focus will be on Connell’s collaborations with other artists over the years including Vincent Chancey, Connie Crothers, Jorge Sylvester, Rocco John Iacovone, Golda Solomon, Andrea Wolper, Michael TA Thompson and many more, in large assemblages and intimate combos. The sounds range from free to world music, new composition to latter-day Beat poetry to exploratory visions. World Peace, With or Without People: Music from the Legacy of Horace Tapscott, performed by the Dark Tree Ensemble - Music from the Los Angeles experience. 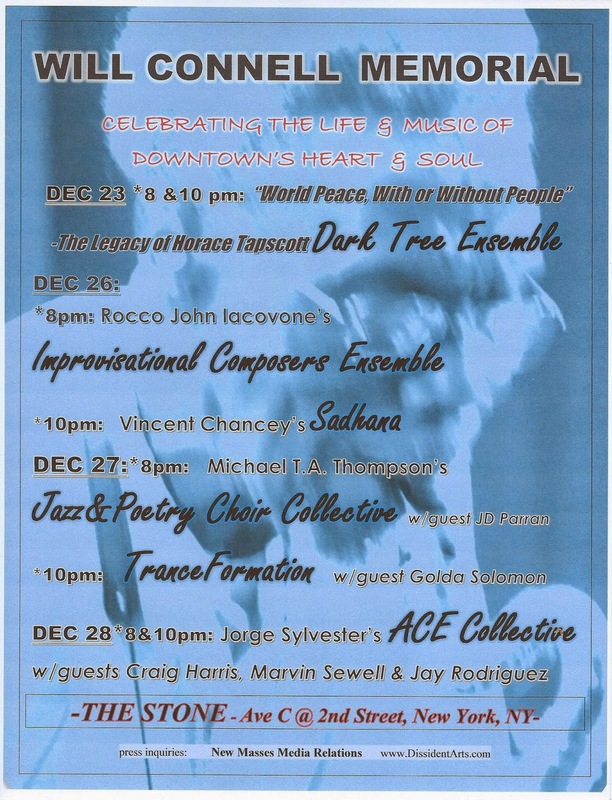 World Peace, With or Without People: Music from the Legacy of Horace Tapscott, performed by the Dark Tree Ensemble - New Music in New York. The son of a violin prodigy deprived of the profession by racist politics, Will Connell Jr became aware of both music and the struggle for justice as a child of the ‘40s. Jazz served as a source of art and great pride for the African American community, and its impact on Connell was nothing short of visceral: “I heard Billie Holiday at 17. Tears ran down my face like Niagara Falls”. That same year, 1956, Connell joined the US Air Force, serving some nine years. In between tours he purchased an alto saxophone but didn’t dedicate himself to music until surviving a chemical blast that blinded him for several days. Lying in an Air Force hospital in darkness, Connell vowed that if he regained his eyesight, he’d formally study this art that had driven him so deeply. This and the gnawing outrage about the military’s treatment of Black servicemen led to his decision re-join civilian life. Studies at LA City College (Dolphy’s alma mater) led to years of close work with Horace Tapscott wherein Connell served as reeds player and music librarian and copyist. The Tapscott organization was LA’s paramount arm of the Black Arts Movement and its immersion into African American culture and liberation had a lasting impact on Connell. By 1975 Connell relocated to NYC’s Lower East Side where he resided for the rest of his life. Through the decades he performed or recorded with such luminaries as Cecil Taylor, Anthony Braxton, William Parker, Rahsaan Roland Kirk, Chico Hamilton, Pharoah Sanders, Butch Morris, Roy Campbell, Sam Rivers, Steve Swell, Billy Bang, Henry Threadgill, Oliver Lake, Daniel Carter, Jason Hwang and many others. He also engaged in extensive projects as music copyist, most notably Ornette Coleman’s ‘Skies of America’ as well as for David Murray's Big Band, the World Saxophone Quartet and a bevy of R & B and pop artists ranging from Michael Jackson and Roberta Flack to Stevie Wonder and Simon & Garfunkel. Will Connell was a deeply relevant part of this rather unclassifiable musical genre which prides itself on free improvisation as much as post-modern composition, global sounds and the bite of revolutionary politics. Usually preferring to be a member of a band as opposed to its leader, Connell may have been the last of the modest greats. Having served as guest curator at the Stone in 2012, which brought him some note, and featured earlier this year in the Arts for Art organization’s series, and as a member of the Veterans of Free on the Tribute to ‘New York Eye & Ear Control’ concert in June, this master of the New Jazz is now recalled at his rightful place at front and center. I was heartily saddened by the sudden unexpected phone call: downtown’s unsung hero of Free Jazz, Will Connell Jr, was hospitalized and non-responsive. Immediately the jazz and new music community rallied and the outpouring of love for Will was apparent. We’d all been preparing for his big moment at the front of the stage, his week-long residency at the Stone, set to occur in December. None of this made sense yet one day later, November 19, the hush of mourning closed out all else; the little giant was lost to us. Though Will and I only came to know each other several years ago, I connected deeply to him: both in music and politics. When he hired me this past September to serve as publicist for his long-awaited residency at the Stone, we shared long conversations and Will spoke of how deeply this music, the once-New Thing, was born enmeshed in radicalism. When the music and the movement are divergent, the soul, the fight, withdraws. It touched me when he commented, in his characteristic style, "Hey maaaan, you are the most revolutionary cat I‘ve known in many years. You might be the most revolutionary cat I ever met". Coming from this giant of Free, this cohort of Black Arts and comrade of some very heavy activists, this was indeed a prideful moment. More than anything, Will was elated about this Christmas-week residency at the Stone. It was a major acknowledgement of his many years of creativity---in his own adopted ‘hood of nearly forty years. This series of concerts was a retrospective of his musical career as well as a focus on his current performance. He asked me to craft a publicity campaign to highlight the residency’s widespread reach: Will’s own music and that of Horace Tapscott, whom he was most closely associated with, but also many of the NYC friends with whom he'd made music over the decades. Wisdom of his age, Will recognized that he might not get this chance again---so this had to be a performance of the highest level. We discussed his vision for the residency and particularly his ideas for the premier of "World Peace, With or Without People--the Legacy of Horace Tapscott”, which he was most excited about. Here, the sounds and the activism would indeed converge. Will had called me on November 12, a week before his transition, and I immediately heard something in his voice other that the sing-song greeting I'd grown used to. There was anxiety and urgency. He explained he needed to go into the hospital on Friday for same-day surgery and even as he down-played it, I heard the fear. We spoke about this and he told me that he’d only told three people about the procedure he needed: he'd based this on the old adage that in an emergency, "you only call three people: your doctor, your lawyer and your publicist". We laughed over this but he asked me not to speak of it to anyone and I assured him that I would not and that I would check in with him over the weekend. When I called him next, the call went right to voice mail--and I never got a call back. I suspected there'd been complications and considered whom I should call to inquire. And then the grim reports began to come in. As of this writing, the musicians slated to be a part of the week-long residency are hell-bent on keeping Will’s vision alive. Several have been in touch with Will’s daughter Safiyah in this hard time. Our thoughts are with her and the rest of the family. Though details need to be ironed out with the Stone, the current plan is that the week of December 23-28 shall serve as a celebration of Will’s life, a feature for his music, his artistry and the visceral socio-political heart of it all. Will Connell Jr was introduced to music by his father, a violin prodigy. Deprived by racist politics of a career in the classical world, Connell Sr contented his musical longings to avid listening. But music was central to African American family life and jazz served as a vehicle of both art and great pride over the generations. Will Jr became acutely aware of the sounds of Jazz and all music from his earliest memory and was immersed in it even before: “I was told by my parents that Art Tatum played the little piano at my grandmother's house when I was an infant”, Connell recently recalled. As soon as Will Jr was old enough, he began accompanying his father to LA jazz clubs and concert halls where most of the greatest jazz artists of the 1940s and 50s were performing. He became immediately drawn to the saxophonists but elements of the music offered a visceral response that was life-changing: “I heard Billie Holiday at 17. Tears ran down my face like Niagara Falls”, Connell offered in retrospect. That same year, 1956, he was inducted into the Air Force, where he remained for some nine years. Between tours of duty, Connell purchased an alto saxophone and it accompanied him to Okinawa. Performances in bars followed but Connell didn’t become serious about music until a suffering a profound experience wherein he was blinded for several days by a chemical blast. Connell pondered his future in the darkness. He vowed then that if he regained his eyesight, he was going to formally study this art that had driven him so deeply. This promise, as well as his growing outrage about the military’s treatment of Black servicemen and people of color around the world, saw him leave the Air Force forthwith. In 1965 Connell studied at LA City College (Eric Dolphy’s alma mater) while he worked evenings at the local Post Office; during breaks Will studied harmony. Around this time Connell became acquainted with Horace Tapscott, then in the process of building a powerful community-based organization inspired by both the early Black Arts Movement and the Watts riots: The Union of God’s Musicians and Artists Ascension (UGMAA) and the Pan African People’s Arkestra (PAPA). Almost immediately, Connell took a central role in both the organization and ensemble; he was the latter’s librarian. Tapscott urged Connell to learn the craft of music copying and he took tutelage with copyists at the Motown label, now transplanted to LA. Through this association, he began working as a copyist for a wide variety of R and B artists, including Stevie Wonder, Roberta Flack and Michael Jackson, as well as pop artists outside of Motown, Simon and Garfunkel among them. He also worked as copyist for Tapscott’s large ensemble, writing out the parts for diverse instruments even as he performed with it and the smaller groups that sprang from it. Connell credits Tapscott with his political education as well: a young Angela Davis was a frequent guest at the organization’s gatherings and they had a close association with the Black Panther Party and played its theme song, “Seize the Time” in the regular repertoire. The Tapscott bands also played regular gigs at various college Black Student Unions, high schools (at one of these they played opposite Sun Ra’s band) and community events. Almost immediately after Angela Davis’ arrest, Tapscott’s band served as the pit band of a new theatre work by Jack Wilson, ‘Free Angela!’. Connell recalled that while the actors were hesitantly preparing for the premiere, Tapscott took charge and led the band in a lengthy set of explosive music which saw the crowded house quaking with jubilance. The movement was thriving. By 1975, Connell would ultimately leave LA and Tapscott for New York City, which would remain his home. Residing on the Lower East Side, Connell encountered the fading jazz loft scene and the edge of the Beat Generation poets’ waning days. But he was already an elder statesman of the new jazz which became vital as 20th century composition melded into free jazz and the legacy of the blues; this “new thing” crossed culture and encouraged inter-racial creativity through its celebration of radicalism. The music was immediate and vital and Will happily submerged himself into its center. After arriving here, Connell sought out Arthur Blythe, who’d been a part of Tapscott’s band and was now playing with noted drummer-leader Chico Hamilton. Brand new to the city, Will sat in the control room as Hamilton’s band recorded a largely improvised score for a Fritz the Cat cartoon film and he immediately grabbed some manuscript paper and sketched out the music notation as the band played. Presenting it to Hamilton, the impressed leader hired Will to write out the scores for other performances, committing to paper what had previously been lost to the air. Connell was added to the band as multi-reeds player, where Paul Horn, Dolphy and others had preceded him. A year later, Connell was a part of William Parker’s Little Huey Creative Music Orchestra and made an immediate impact downtown. Over the next three decades, he became an integral part of bands led by Cecil Taylor, Anthony Braxton, Butch Morris, Pharaoh Sanders, Roy Campbell, Sam Rivers, Steve Swell, Billy Bang, Henry Threadgill, Oliver Lake, Daniel Carter, Frank Lowe and many others. Somehwere in there he toured with Philly Joe Jones too. He also engaged in extensive projects as music copyist, the most famous of which was Ornette Coleman’s ‘Skies of America’; Will’s work allowed Ornette to see a conductor’s score of this celebrated piece for the first time. He also did the music copying for David Murray's Big Band, the Craig Harris/Seku Sundiata Project for Brown University, and the World Saxophone Quartet, including their Jimmy Hendrix Album. Connell co-founded the band Commitment with Jason Hwang, William Parker and Zen Maatsura in 1978. The band would perform at the Kool Jazz Festival and Moers Jazz Festival during its first year. But in the same period, he began creating music with the newest residents of the East Village, punk rockers and no wave artists. These included James Chance, as well as the bands Minor Threat and Black Flag when they came through town. Other LES jazz musicians who found this genre welcoming included Daniel Carter and Sabir Mateen. Don Cherry also spent significant time with members of Talking Heads and in this period Ornette Coleman lived on Prince Street and grew Prime Time. There was fertile ground for powerful cross-pollination . Connell saw the connection between the ‘70s-‘80s punk movement and the 1960s’ special brand of openness, acceptance and need to break with convention. Through this circle he became acquainted with singer-songwriter Ryan Adams, with whom he’d perform on TV’s David Letterman show some years later. Through the ‘80s and ‘90s, when downtown became Downtown, the music was celebrated and played globally. Will Connell was there to give it street cred. And he continued on this path to serve as a genuine artifact even as he offered a kind of youthful enthusiasm to the moment. Into this century, the vitality was there and an aging Will Connell apparently knew no bounds, never had the want to slow down. He led a series of combos that included such names as Tomas Ulrich, Anders Nilsson, Thurman Barker, Ras Moshe so many others and thrived in his work with the quartet Sadhana, co-led by Vincent Chancey and powered by the young energy of Max Johnson and Jeremy Calstedt. Will was a charter member of the Jazz and Poetry Collective and a series of other bands he was only happy to be a part of if the vibe was there. He served as guest curator at the Stone in 2012, which brought him some note, and his renown among the musicians only grew as he encountered still newer music adventurers and visitors along the way. Yet popular acclaim continued to elude him. Will was a featured performer earlier this year in an Arts for Art concert dedicated to Tapscott’s legacy. He was also a member of the at least a couple of all-star bands for events that this author produced including the ‘Drums For Warren’ benefit concert in support of Warren Smith, and the ‘The Tribute to New York Eye & Ear Control’ concert this past June and the 2014 Dissident Arts Festival of which he was the headliner. Though rarely in the spotlight over the decades, Will Connell was a deeply relevant part of this rather unclassifiable musical genre which prides itself on free improvisation as much as post-modern composition, the expansiveness of world sounds and the bite of revolutionary politics. And yet his message, at the close of each warm encounter, remained “peace”. That was Will, the rebel who extended an open hand, never a fist. Usually preferring to be a member of a band as opposed to its leader, often seen as “a section man” in larger ensembles and a “background” guy though a powerfully screaming soloist, Connell may have been the last of the modest greats. And oh, how this quiet giant is missed.